2 bedroom 2 bath Gulf Front Unit! Welcome to Gulf Tower 5B, located on beautiful Gulf Shores Alabama's West Beach. This two bedroom, two bath condominium, has a king bed in the master bedroom with sliding doors leading to the gulf front balcony and it's own private bath. The guest bedroom has two twin beds which is located next to the guest bathroom. Each bedroom has a flat screen T.V. The living room has plenty of seating as well as sofa with a hide-a-bed and a flat screen T.V. The kitchen is fully equipped to handle all of your cooking needs. There is a washer and dryer in the unit. The balcony is the perfect place to have your morning java while watching the sunrise and to watch the dolphins play. 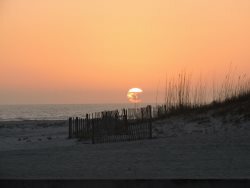 If you have never been to Gulf Shores, you are in for a treat! We promote family vacations, rather than the party towns like some other cities are popular for. There are so many things to do, from fishing, water parks, arcades, the Zoo, restaurants, etc etc, or just take it easy by the pool or laying out on the beach. The complex is within walking distance to restaurants and shopping. The only thing that is missing is you! !